Puerto Vallarta Zona Romántica Condo, En V177. A pocos pasos de la playa. Este es un muy bien decorado de un dormitorio apartamento de un cuarto de baño, completamente amueblado y cocina bien equipada. Es en el restaurante y zona de vida nocturna más populares de Puerto Vallarta y sólo media cuadra de la playa "Los Muertos" y sillas de color azul. sala de estar con TV de 47 pulgadas, cable, Netflix, reproductor de blue ray, sala de estar y un sofá / cama para huéspedes adicionales. Tiene un gran patio amurallado con sillas y mesa de comedor. 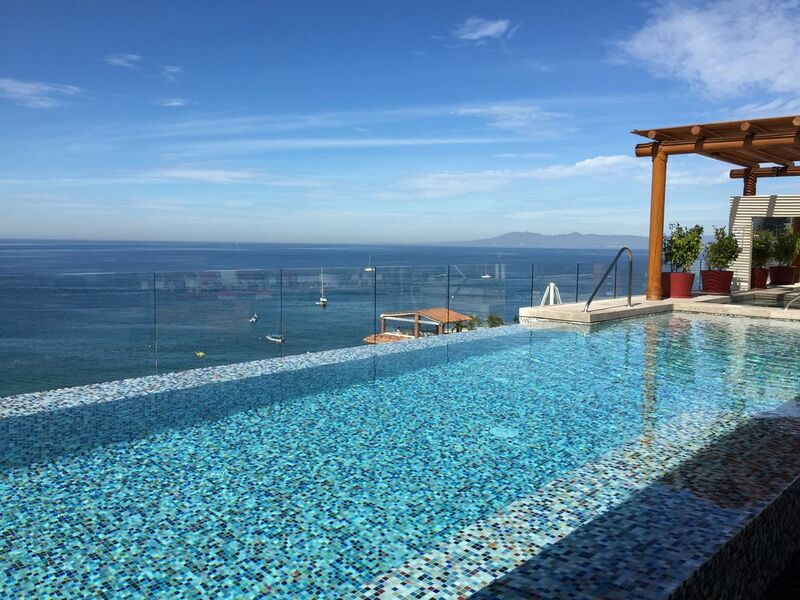 Puede disfrutar de las zonas comunes increíbles en la parte superior del techo del edificio, como una zona de barbacoa, sillas de playa, piscina climatizada y jacuzzi con una vista impresionante de la bahía y la zona de Puerto Vallarta, gimnasio, cuarto de baño y ascensor. Este edificio está situado en una calle tranquila en el centro de la "zona romántica", en el restaurante y zona de vida nocturna más populares de Puerto Vallarta y sólo media cuadra de la playa "Los Muertos" y sillas de color azul. Como cortesía, se incluye una variedad de películas blu ray. This is a beautiful, clean condo in a great location. The building is very secure with a security guard monitoring the entrance. The unit is very modern and pleasantly decorated. The bed is very comfortable, which is not something you always find in Mexico. The appliances are full size and high-end. Inside the condo was very quiet. We never heard any of the other residents or the noise from outside if our patio door was closed. We did find the patio of the condo to be noisy because of the construction happening nearby. We really enjoyed the lovely rooftop infinity pool and the hot tub. We found this area to be quiet and very relaxing. There is also a BBQ and a great gym up there . Luis was very nice to rent from. He asked us a few days before our arrival about what beverages we would like and had them chilling in the fridge when we arrived. He was in contact with us via e-mail throughout our stay. It is just a two minute walk to the beach from the condo and there are many great restaurants, shops and shows within walking distance. We would be happy to come back to this accommodation if we visit PV again. Fantastic space in a prime location! Luis' condo was an amazing experience! A 2 minute walk to the beach and minutes to numerous restaurants in the incredible zona Romantica! The space itself was clean and inviting, exactly like pictures! The rooftop pool and deck area are beyond inviting! The other guests we met in the building were friendly and helpful! Security was friendly and accommodating! We would definitely rent from Luis again and we definitely give this place 5 stars! Thanks Jules, for staying at my place, hope to see you again. Great location. First class building. Great vacation. So comfortable in the condo. Excellent location and great accomodations! Luis was an excellent host and the location and accommodations were superb! We thoroughly enjoyed our stay and can't wait for our next trip to PV! The condo unit was clean and exactly as pictured in the pictures provided by the landlord. The landlord was exceptionally cooperative in all aspects of the rental. The rooftop pool was an outstanding place to sun and read. Others who were staying in the building were polite and considerate in their sharing of the common areas. Security at the building was always present and reassuring. Location was exactly where we wanted ( walking distance from everywhere). You really cannot go wrong renting from Luis.